You've added New Orleans Airboat Tours LLC, Old River Road Plantation Adventure, Rock n Bowl - Mid City Lanes, and other attractions to your itinerary. You'll visit kid-friendly attractions like Jackson Square and Audubon Butterfly Garden and Insectarium. There's still lots to do: contemplate in the serene atmosphere at St. Louis Cathedral and brush up on your military savvy at The National WWII Museum. 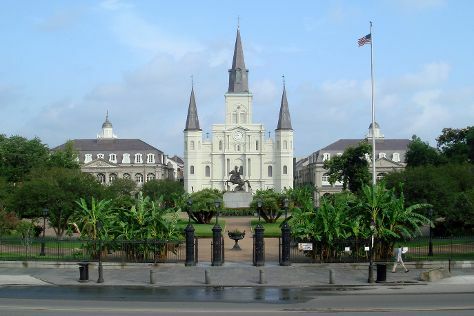 To see photos, traveler tips, where to stay, and other tourist information, read our New Orleans travel route builder tool . Edinburg to New Orleans is an approximately 6-hour flight. You can also drive. Traveling from Edinburg in January, expect nights in New Orleans to be about the same, around 51°F, while days are slightly colder, around 59°F. Finish up your sightseeing early on the 3rd (Mon) so you can travel to Houston. To see traveler tips, photos, other places to visit, and other tourist information, go to the Houston trip site . Traveling by flight from New Orleans to Houston takes 4 hours. Alternatively, you can do a combination of car and flight; or drive. Traveling from New Orleans in February, expect nights in Houston to be about the same, around 52°F, while days are somewhat warmer, around 69°F. On the 3rd (Mon), you'll travel back home.